COMBI-NATION provides a thorough boiler servicing in Southampton and the Hampshire areas. Our team have years of experience and will provide a complete service for the boiler in your property? Why bother with an annual boiler service? Are you unsure if you need boiler servicing? Like a car, your boiler needs a regular service as it will be used on a constant basis. During the course of a year, deposits will build up in the boiler which will inevitably reduce the overall system efficiency of your boiler. The main disadvantage of this is that there will be higher gas or oil bills for your property. If you ignore servicing your boiler because it is operating perfectly, this will be false economy. You should ensure that boiler regardless of its age is serviced on a regular basis for safety purposes. If you have an old boiler in your property, it is imperative that you have it checked on an annual basis to ensure your boiler is operating properly. What will happen during a boiler servicing? By choosing our boiler servicing services, you can be assured that our servicing will lengthen the life of your boiler and avoid breakdowns. 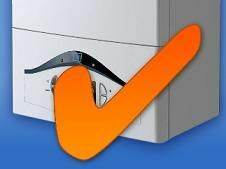 COMBI-NATION also provides gas fire servicing, Landlords Gas Safety Inspections and all commercial boiler servicing. We will provide discounts if multiple services (i.e. boiler and fire) or inspections are provided by our team on the same visit.